The summer weather often has homeowners thinking about adding new outdoor structures to their homes. Last year, the top three most popular outdoor structures according to the 2017 Residential Landscape Architecture Trends Survey were pergolas, decks, and fencing. But there is one outdoor structure that will never go out of style: a screened porch addition. Allowing homeowners to enjoy the outdoors without actually having to be outdoors, a screened porch enclosure is the perfect addition to any home. If you’re looking into porch additions, there are a few must-have features you should consider for the added space. Lighting: Lighting is an important feature of any area in a home. But it’s especially important for a screened porch addition. With the right lighting, you’ll be ready to use the area for a variety of things. For example, if you plan on entertaining at night, you should include some twinkle lights around the ceiling for a festive feel. Or if you plan on reading out there, make sure it’s well lit so you don’t strain your eyes. Overall, it’s important to think about how you’re going to use the space and what kind of lighting you’ll need. Kitchen area: With more homeowners cooking outside, it’s important to have a nice kitchen area to use. This is especially great in the summertime when the whole family wants to be outside. Working with your home remodeling contractor, you can include a kitchen area in your enclosed porch to use all year round — with the right set up, you and your family can enjoy eating right in a dining area in your enclosed porch. It can be a convenient way to enjoy the outdoors without having to worry about bugs bothering you while you’re eating. Entertainment: If you’re planning on using the enclosed porch as a room for relaxation and fun, then it’s important you have the right entertainment equipment. One option is to include televisions. Family movie night just got a whole lot better when you can watch your favorite movies with fresh air blowing through. Or if you want to have parties, then music is a must. Installing outdoor speakers is an easy task that can allow you to blast your favorite tunes whenever you want. With the right equipment, you’ll never be bored in your enclosed porch. 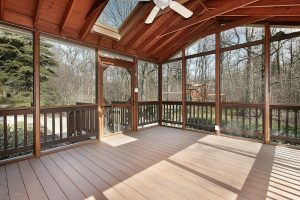 A screened porch addition is a great option for any home. Whether you’re looking for additional entertainment space, a safe area for the kids to play, or a way to enjoy the outdoors without being bothered by external elements, consider adding an enclosed porch to your home.